We’ve owned many Dals in our lifetime but Deeter is truly one of a kind. Whelped 12/3/97, he finished his championship at 9 months of age with four majors. Deeter made his debut at DCA 98 (first 6-9 Sweeps, first 6-8 Futurity, 2nd 6-9 puppy) and our lives have never been the same. A very powerful moving dog with extreme muscling developed from running our yard. 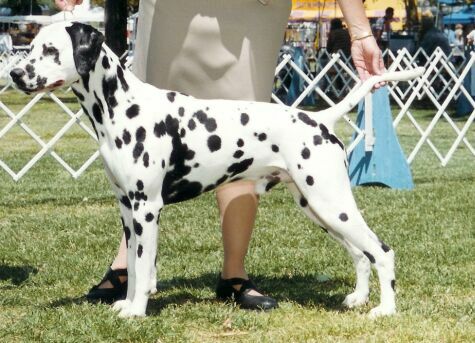 #9 in breed, #14 DCA, #29 all breed in 2000. Completely breeder/owner handled. His pups with our Angie produced AM/MEX Ch Thidwick Diesel CD, a group placing youngster. 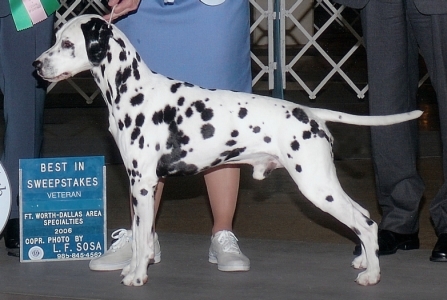 Deeter was #9 Novice Obedience Dalmatian in 2004 and was one of the first Dalmatians in the country to complete his Rally Title in January of 2005. Retired from competition, Deeter occasionally makes an appearance in the Veteran Class. Deeter is the sire of 5 champions with more expected. Full dentition. BAER bilateral. Hips OFA Good. Elbows OFA Normal. Thyroid Normal. CERF Normal - cleared of ISD.